Beyond Genealogy: Does Size Matter? 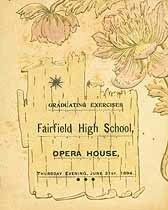 As part of a large update to the Family Tree Connection database that finished this morning, an 1894 graduation item with just THREE seniors was added. It was for the Fairfield High School in Maine, and the surnames were WARREN, CHASE and HATCH. I love these kinds of items, and there are hundreds of them in the database. First, you have to wonder just how many copies of this little document did they print, and then how many have survived 113 years later! For the past four years I've been on a quest to gather up as much of our ancestral history as possible with the goal of making these treasures available online for genealogists. I like the term "public collections", as while I am collecting these items, they're being shared. Of course, the hidden agenda is that I hope to find some neat items like this about my own ancestors. How cool would it be to know that not only did you ancestor graduate, but at the ceremony they read "Hiawatha's Wooing" by Longfellow as one of the students did according to this program. So, while everyone "oohs and ahhs" when a document with thousands of names gets uploaded, I think the real exciting items are the ones with fewer names, and from more obscure locations.